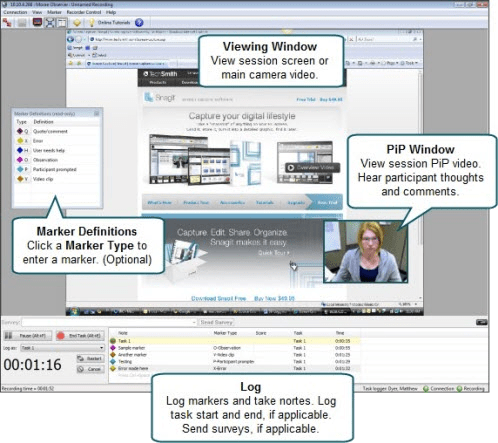 Each person using Observer can log markers, marker scores, and add text notes which are sent back to the Recorder and saved with the recording file. Includes quick tips for logging. One Observer designated as the task logger logs tasks and task scores. At the end of a session, the tasks and task scores are sent directly to Recorder and saved with the recording. Observer includes a Log displayed like a spreadsheet with rows and columns. The Log displays markers entered in Observer during the recording. If you are the task logger, the Log also displays the task logging area. Tasks will only appear in the log if you are the task logger. Rearrange the columns in the log in the most convenient order for you. During recording, you can go back and edit previously logged markers and tasks. Once you end a task you can't change which task it is logged as. You can, however, change or update the note or score associated with the task. You can only change the task after you import it into Manager. The markers and tasks defined in the study configuration are available to log. See the Morae Recorder Help for information on setting up a study configuration. If you want to log without using your mouse or keyboard, you can interact with Observer using a remote. Log marker and task scores to use in Manager during analysis. For example, if you log marker scores, you can create a graph that automatically calculates error severity rate. While you can add markers, tasks, and scores in Manager after importing the recording, you will save time by logging tasks and markers during a session. You can save a copy of the log after each session as a .txt file to print or open in other applications (i.e. Microsoft Excel). You can save a copy of the recording as a WMV. The score descriptions set up in the study configuration show up as tooltips when you are logging.